The multicolor glitter in the spreader is particularly suitable for extravagant Nail Designs & and make-up! Put you a luxurious Phantasy makeup and creative fingernails with loose glitter particles at Carnival & Halloween! 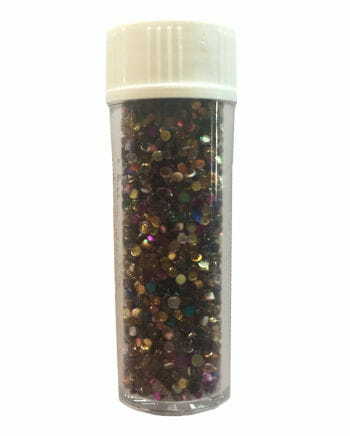 The practical spreader you the multicolor glitter good dose on your makeup and nails.You can add glitter powder but also with your fingers or a brush wonderful apply to your creative make-up results.The colorful glitter you mixed best with your makeup or sprinkle you on your still wet nail polish.Many other colorful items like glitter Stargazer Face Diamonds Coloured and the Glitter Make Up Stack check out our wide product range. Attention! Do not scatter in the eye! The article is a makeup & nail design accessory for adults and not a toy.Not suitable for children under 3 years.May contain small parts that can be swallowed - suffocation. Glitter Fingernails Gold 12 Pcs.